Enryaku-ji, originally known as Hieizan-ji, was built by Saicho, the founder of the Tendai sect, as a temple to guard the Heian-kyo against the evil believed to enter from the northeast. Enryaku-ji developed into a center of monastic discipline that educated numerous great monks founded important Japanese Buddhist sects: eg. Honen, Eisai, Shinran, Dogen and Nichiren. By the latter half of the 10th century, Enryaku-ji reached its heights and its configuration completed as they are today, i.e. 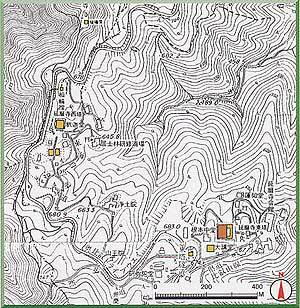 centered around three principal tracts known as Toto (east pagoda), Saito (west pagoda) and Yokawa. The temple was ravaged by fire on several occasions thereafter and was rebuilt each time; the worst damage occurred in 1571, when Enryaku-ji was put to the torch in the course of a military campaign, and lost most of its buildings. The main hall for the entire temple complex is the Komponchudo, reconstructed in 1642. At ground level it measures 11bays across the front and 6 bays from front to back.. The front part of the building contains the outer worship hall (gejin), measuring 1bay from front to back., and the plank-floored inner worship hall (chujin), also 1 bay deep, while the sanctuary (naijin), at the rear of the building, measures 4 bays in depth and has a flagstone-paved earthen floor. 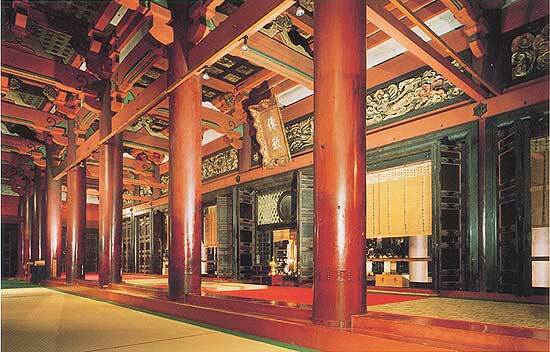 The naijin, in accordance with precedent, houses three distinct halls with finely coffered ceiling. The temple's three tracts contain numerous other buildings bating back as late as the 17th century, and preserve the condition of the temple of that period.